With over 30 years experience in organic farming, Barry Green is involved in something called the New Food Movement. In Healthy Soils, Healthy Communities he hears from a group of Australians concerned about the future of food, and the solution they’re putting on the table. Produced by Barry Green of Donnybrook Community Radio. Supervising production by Ian Hill. I have been farming and investigating organic farming principals for 30 years on our Boronia Farm at Donnybrook in Western Australia. I’m also Chairman of Donnybrook Balingup Community Radio Inc and own Western Tourist Radio (WTR). 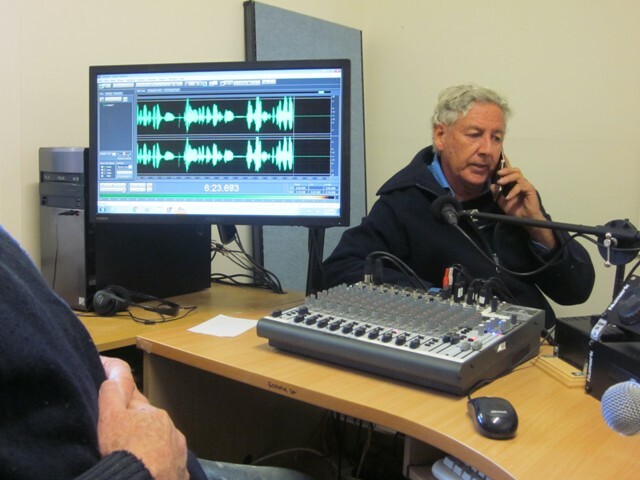 WTR operates Radio WA 87.6 FM in East Perth and in the South West coastal tourism towns, “telling the stories of people and places in Western Australia”. In March 2018 I attended an event titled Healthy Soils, Health Communities, where I met Charles Massy, author of Call of the Reed Warbler, a new agriculture, a new Earth. 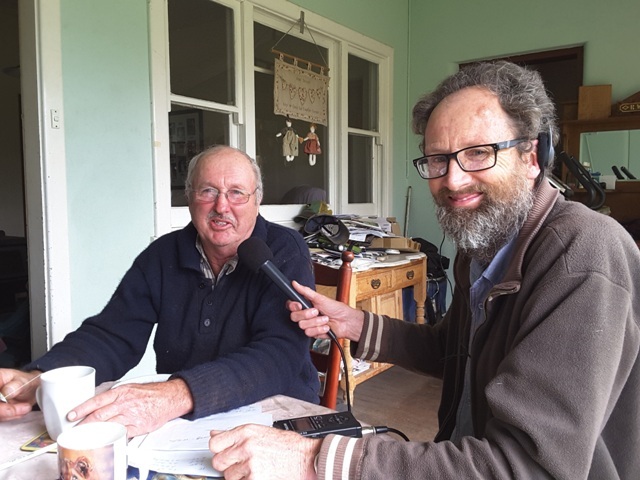 IMAGE: Author and farmer Charles Massy interviewed by Barry at the studios of Monaro FM. Charles explains how industrial agriculture came about, and tells the stories of many innovators who are showing how, by working with nature, farmers can produce healthier food with less expensive and often toxic inputs, resulting in improved farm profits which helps to rebuild rural communities as well as storing carbon in the soil and reducing atmospheric carbon dioxide. 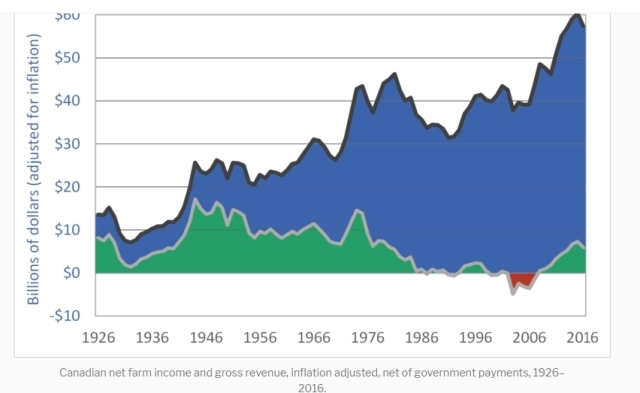 Most agricultural research has been done by companies selling products to farmers, resulting in declining net farm income since the second world, as illustrated by the Canadian graph below. Food has been treated as just another commodity, to be produced at the lowest possible price. But it's much more than a commodity - it is the foundation of our civilisation and our individual health and wellbeing. I am delighted to have this opportunity explore the connection between the health of our soils, our communities and ourselves. IMAGE: Barry Green (right) interviews farmer Ron Watkins. All farmers involved in regenerative agriculture are innovators. Ron Watkins talked about the journey of the innovator which I think is well worth listening to. With the increasing concentration of city centric media companies, I think that Community Radio and Tourist Radio provide a vital voice for community and small businesses. I love radio as a communication tool, and while I have been making programs for our tourist radio service, it was great to have Ian Hill as a mentor. Thanks Ian. Thanks also to Phil Daley from 2MNO Monaro FM for recording Charlie’s end of our phone interview. International Secretariat of the World Association of Community Radio Broadcasters (AMARC) calling for "soil stories" in project collaborating with the Food and Agriculture Organisation of the United Nations (FAO). With the proliferation of global information and communications technologies (ICT), the concept of community no longer has geographical limitations. Yet, from ecological and social perspectives, connecting people and communities to their immediate environment is now more urgent than ever. In this paper we show how an Indigenous led initiative reaches across geographical and cultural gulfs by using digital media in ways that are profoundly embedded in the values associated with specific places. We refer to a grass-roots Indigenous created and led organization that with support from numerous partnerships across Australia has for many years used media to convey cultural and environmental values. The methodology of Traditional Knowledge Revival Pathways (TRKP), co-created according to the ancient knowledge system of the Kuku Thaypan Traditional Owner Elders in Cape York Peninsula, illustrates the way media can be used to traverse disciplinary boundaries and connect both Indigenous and non-Indigenous people to places. We start by describing how the simple act of picking up a camera to film this ancient knowledge system led to the creation of Traditional Knowledge Revival Pathways (TKRP). Then, we explain how the methods of using various media are anchored in the Indigenous sense of country and interconnectedness, embedded in the spiritual, philosophical and ideological perspectives of Traditional Knowledge. We outline processes that scaffold these methods, such as the way media is controlled by participating Indigenous communities and incorporated into practice and research in environmental management. This leads us to discussing some of the roles of different media in reflecting on practices, within and between communities, and translating and communicating across worldviews. We conclude by indicating how using media can connect people to place and inspire their reflection upon the mediation by media in these connections. We propose this provides new insights for improving media tools, training methods and approaches to solution making to issues of environmental, social and economic concern.